Hotel – Home, two sectors where KRION® can be used in any room. 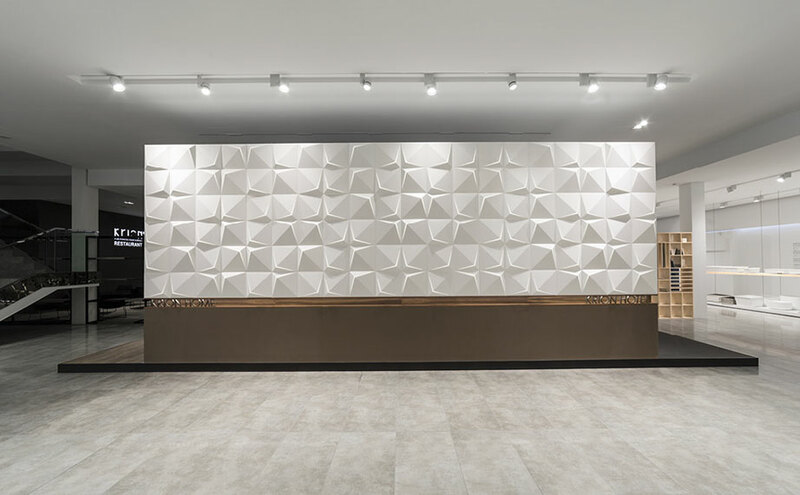 Both sectors make a multitude of applications possible, with coverings, units, countertops, signage, and countless possibilities, which for another year we are presenting in our Showroom. 32m2 in an airy space divided by windows and mirrors which separate the bathroom area from the relaxation area. We can find KRION® transformed into a bed and bedside tables which stretch across 3 walls of the room, with unnoticeable joins. In the wet area, the new Basic T803 bathtub is notable, finished with a backlit strip on its edge in our 4102 Extreme Light colour. The covering of the wardrobe and its shelves is created with 8904 Black Mirror in a high gloss finish. 115m2 divided into 5 atmospheres with an interior garden connecting them, visible from any point of the stand. The hotel section could equally be the kitchen of a private home, and therefore the L101 Carrar Soft colour has been used for the countertop and coverings, even demonstrating the thermocurving property (the new Style Antracita 50x40 sink). We enter a Japanese style living room with an impressive natural wood table, surrounded by 9509 Dark Copper, with coverings and lattices also made from the same material, and covered with A501 Asteroid Mocha. We then find the kitchen with a 9106 White Copper countertop, C833 Unique On Top sink, and cupboards made with 9905 Elegant Black. Continuing through the room we find the laundry area with A101 Asteroid White in both the countertops and the coverings (U801 50x40 household sink), a way of bringing glamour even to the less visible areas of our home. Next to the two entrances/exits are bathrooms in which we present the new 3Way round gold finish, which is perfectly combined with the colour selected for coverings in the space, 9908 Black Gold.